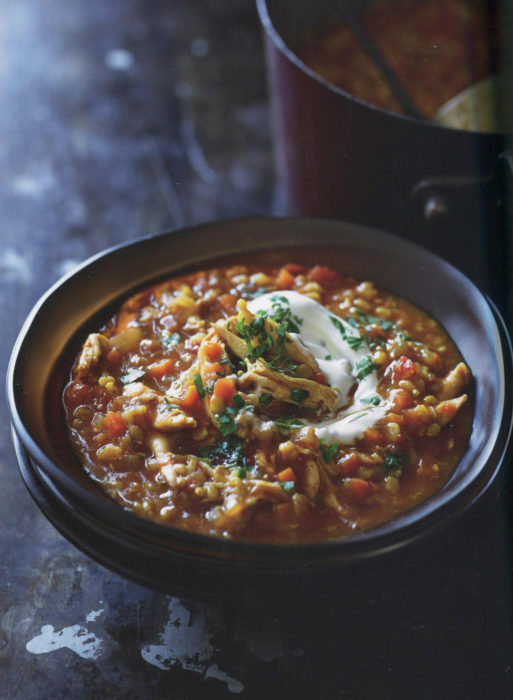 It’s almost faster to make Mulligatawny soup than to say the name. The dish has Indian origins but these days it really is considered an English soup. When a recipe travels that far, there can be lovely variation in the recipes that now appear. For example: meat or no meat? Here, there is meat. Is this version, from Adam’s Big Pot, you will find shredded chicken, yogurt and chicken stock. Plus a modest armada of spices and veggies and even fruit. Yes, there’s an apple in your soup. One thing that always impresses me about Mulligatawny is its beauty in the bowl. It has eye appeal and, with your first bite, flavor appeal too. You can endlessly experiment here, switching in different veggies. And “curry powder” can mean anything from mild to sun-scorching. Have fun. This sits on the stove for a couple of hours. Be prepared for a spicy kitchen. Heat the butter and olive oil in a large pot over medium heat and fry the onion and garlic until softened. Add the curry powder, garam masala, salt, and tomatoes and fry for a minute, or until the spices are fragrant. Add the chicken stock and rice and simmer, covered, for 1½ hours, stirring occasionally. Add the apple, carrot and sweet potato and simmer for a further 30 minutes. Adjust for seasoning with a little salt if necessary. Stir through the shredded chicken, if using. Stir through a spoonful of yogurt (if using) and scatter with chopped coriander to serve.